I love shopping for surprises like these to treat myself. For the holidays, I always enjoy putting together little self-care themed gifts for the people I love. These are the products that always make wellness fun, easy and luxurious. Lush Cosmetics always has been and forever will be one of my favorite beauty brands. A nice, luxurious bubble bath melts stress away with ease. With Lush, you know you’re getting the highest quality products. Lush offers great holiday gift sets that are already put together and beautifully packaged, but it’s easy to create your own gift set using products you know and love. Some of my favorite bath products to gift include the Pearl de Sel bath bomb ($6.95), Butterball (and its Butterbear counterpart, both $4.95), and the Milky Bath Bubble Bar ($7.95). Going right along with a relaxing bubble bath is lighting a comforting candle and settling in for the night. Candles set the mood for relaxation, and make a great gift because most people don’t treat themselves to nice candles. These soy wax candles are an even better gift because they’re so much healthier for you, and self-care should make you feel good inside and out. A small business I love for soy wax candles is Candelles. They hand-pour their candles in small batches and pay so much attention to detail in capturing the perfect scent. Doing your nails is a great form of mindless relaxation, and gifting someone (or yourself) some new nail polish and a top coat can spark a night of self-care. OPI has such quality polish that doesn’t chip for days and looks amazing on different skin tones. OPI also has great gift sets at Ulta Beauty, like this holiday mini set. This list-based journal is so cute for staying grounded and mindful. Writing and journaling are always super therapeutic, but this journal is targeted towards bringing out light and happiness, perfect for a thoughtful holiday gift. If you wanted to gift someone a normal journal, though, some of my favorites to give are from Kate Spade New York, like this beautiful floral-printed one with a sweet quote ($18). I received this last year for the holidays and it has been so much fun. 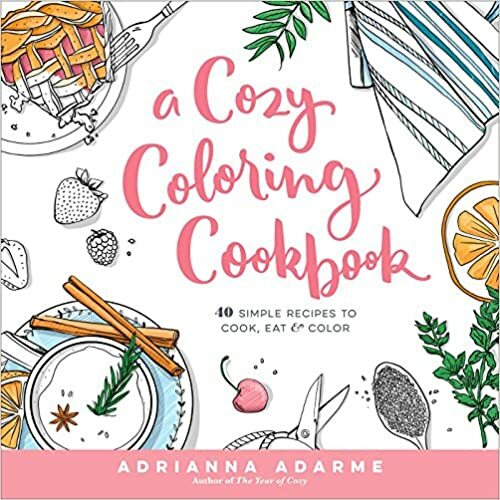 This is basically the cutest cookbook ever from blogger Adrianna Adarme, who combined the soothing powers of an adult coloring book with amazing recipes and photos of her cute corgi, Amelia. What more could you possibly ask for? With 40 recipes, ranging from chocolate chip cookies to spaghetti and meatballs, you'll have endless amounts of culinary therapy, plus art therapy. Add a nice pack of colored pencils and you have an awesome gift for anyone in your life. Throwing on an old tee shirt and heading off to nap on the couch is fine, but nothing feels nicer than going to lounging in a soft, luxurious Comfy. Yes, this magical sweater called The Comfy is also a blanket and literally the softest, warmest thing you can wrap yourself in this winter. They come in all sorts of colors and make a lovely gift, especially if you add a pair of fluffy socks. I know what you’re thinking: Who in their right mind would spend this much on candy? Trust me, it’s worth it. Lolli and Pops is a gourmet candy shop that is cute as can be and just as delicious. Their website offers tons of beautifully packaged, handcrafted candy gifts, but my favorite of all time is this s’mores one. For the value, it’s a great price. Plus, if you’re giving this as a gift for someone else, it comes in a lovely package and saves you some time from wrapping. If you’re shopping for someone who loves chocolate, but don’t want to blow your whole budget (I get it – I’m the same way! ), I love Cadbury’s chocolate ($1.99 each). To create a simple but adorable gift, I’ll stack a few bars together with a pretty bow and a sweet note. This is my all-time favorite sheet mask. Saturated with 100 percent natural oatmeal extract, this mask soothes skin and leaves it soft and smooth. I use this mask all the time because it’s so affordable and lovely. As someone who has really sensitive skin, I love products like this one that really work without being over-the-top or expensive. Whoever you’re shopping for this holiday season, pamper them or yourself with some quality self-care gifts. Spreading self-care and de-stressing your friends and family will keep the season merry and bright for everyone, plus help you start the new year off right. Kaitlin is a college student, blogger over at http://www.thecuriouslemon.com/ , and couldn't be more excited to join the Her Campus team as an Editorial Intern. Kaitlin will never turn down a beach trip, ice cream, or the chance to pet a dog. To see more of her adventures, check out her blog, follow her on Instagram @kaitlinmarks, Twitter @kaitlinmarks05, or her personal favorite Pinterest at https://www.pinterest.com/kaitlinmarks5.